Explanation: Watch Juno zoom past Jupiter again. NASA's robotic spacecraft Juno is continuing on its 53-day, highly-elongated orbits around our Solar System's largest planet. The featured video is from perijove 16, the sixteenth time that Juno has passed near Jupiter since it arrived in mid-2016. Each perijove passes near a slightly different part of Jupiter's cloud tops. This color-enhanced video has been digitally composed from 21 JunoCam still images, resulting in a 125-fold time-lapse. The video begins with Jupiter rising as Juno approaches from the north. As Juno reaches its closest view -- from about 3,500 kilometers over Jupiter's cloud tops -- the spacecraft captures the great planet in tremendous detail. 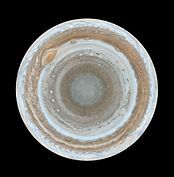 Juno passes light zones and dark belt of clouds that circle the planet, as well as numerous swirling circular storms, many of which are larger than hurricanes on Earth. As Juno moves away, the remarkable dolphin-shaped cloud is visible. After the perijove, Jupiter recedes into the distance, now displaying the unusual clouds that appear over Jupiter's south. To get desired science data, Juno swoops so close to Jupiter that its instruments are exposed to very high levels of radiation. 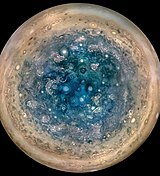 Are the poles of Jupiter really bluish, or is that just an "illustration effect"? I would guess they really are "bluish". All the other polar images in colour from Juno have shown much the same. There's never much light at the poles though, due to Jupiter having almost no axial tilt. <<The Planets, Op. 32, is a seven-movement orchestral suite by the English composer Gustav Holst, written between 1914 and 1916. Each movement of the suite is named after a planet of the Solar System and its corresponding astrological character as defined by Holst. The concept of the work is astrological rather than astronomical (which is why Earth is not included, although Sun and Moon are also not included while including the non-traditional Uranus and Neptune): each movement is intended to convey ideas and emotions associated with the influence of the planets on the psyche, not the Roman deities. The idea of the work was suggested to Holst by Clifford Bax, who introduced him to astrology when the two were part of a small group of English artists holidaying in Majorca in the spring of 1913; Holst became quite a devotee of the subject, and would cast his friends' horoscopes for fun. Holst also used Alan Leo's book What is a Horoscope? as a springboard for his own ideas, as well as for the subtitles (e.g., "The Bringer of...") for the movements. The orchestral premiere of The Planets suite, conducted at Holst's request by Adrian Boult, was held at short notice on 29 September 1918, during the last weeks of World War I, in the Queen's Hall. It was hastily rehearsed; the musicians of the Queen's Hall Orchestra first saw the complicated music only two hours before the performance, and the choir for Neptune was recruited from pupils from St Paul's Girls' School (where Holst taught). Neptune was one of the first pieces of orchestral music to have a fade-out ending. Holst stipulates that the women's choruses are "to be placed in an adjoining room, the door of which is to be left open until the last bar of the piece, when it is to be slowly and silently closed", and that the final bar (scored for choruses alone) is "to be repeated until the sound is lost in the distance". Holst's daughter Imogen (in addition to watching the charwomen dancing in the aisles during Jupiter) remarked that the ending was "unforgettable, with its hidden chorus of women's voices growing fainter and fainter... until the imagination knew no difference between sound and silence". Neufer, I think the true colour image you've shown was a map constructed from Cassini data, not Juno. The poles were only observed by Cassini at an acute angle, which makes a big difference. The Cassini map shows the whole southern hemisphere, whilst your comparison image from Juno shows much less of it. I'm not suggesting that the poles really look quite as blue as the enhanced colour images, but given that they purport to be enhanced and not false colour images, it seems reasonable to assume the poles are somewhat bluish in reality. Interesting. Even though it says this perijove is a different track, I think I seen the Jupiter dolphin again starting around 25 seconds. Seen the dolphin the last time 2 months ago except this time the dolphin is more on its back. What are the odds the dolphin appears again considering a day on Jupiter spins around in just 10 hours and Juno is in a 53 day long orbit? Oh, boy, another composite, of hundred - thousands? - of images glued together. Wow! Holst knew even then that there were no more planets! <<Pluto was discovered in 1930, four years before Holst's death, and was hailed by astronomers as the ninth planet. Holst, however, expressed no interest in writing a movement for the new planet. He had become disillusioned by the popularity of the suite, believing that it took too much attention away from his other works. many of which are larger than hurricanes on Earth. I would think that many are larger than Earth? There are definitely clouds that are relatively bluer. Juno color images always look a bit odd after the contrast is tweaked way up, though. Seán Doran sometimes posts "true" and "enhanced" versions. I didn't even think to look up Pluto vis-a-vis Holst because of his never having composed a Pluto overture. Learn something new every day, especially here! then you are probably smaller than the Earth. Also, The Planets is based around astrological themes, not astronomical. And even though neither Uranus nor Neptune are found in classical astrology, they had been adopted by modern astrologers by the time Holst wrote his piece in the early 20th century. Not so Pluto at the time of Holst's death. Spectacular image. Thanks to everyone who made it happen. Does anyone know of a version of this flyby video that hasn't been enhanced? O.K. But The hurricanes sound kind of small for Jupiter the way described: I would hate to have one of those size canec on Earth! Thanks geck. That's the first "true" colour Juno image I've seen of the poles, I think [since https://apod.nasa.gov/apod/ap160914.html]. Interesting. Hmmm. With the "true" colours having such low saturation, I do now wonder about the enhanced colours. All colours with low saturation have very similar looking grey hues to me. (I am not Ann.) Makes me wonder if the lower light levels at the poles might be the main factor in the darker, but possibly not really bluer colours we see in the "true" colour images. What always bothers me about these stitched together images is they show no cloud movement whatsoever. why can't we see the storms moving on these flybys? Have a look at the APOD (and its related discussion) I linked in the post above yours. It shows the storms moving, but it requires a much longer time period.